The final resting place of Sir Winston Leonard Spencer Churchill is in a quiet corner of a peaceful English churchyard. It was his own decision to be buried in Bladon, just a long stone’s throw from Blenheim Palace, where he was born. 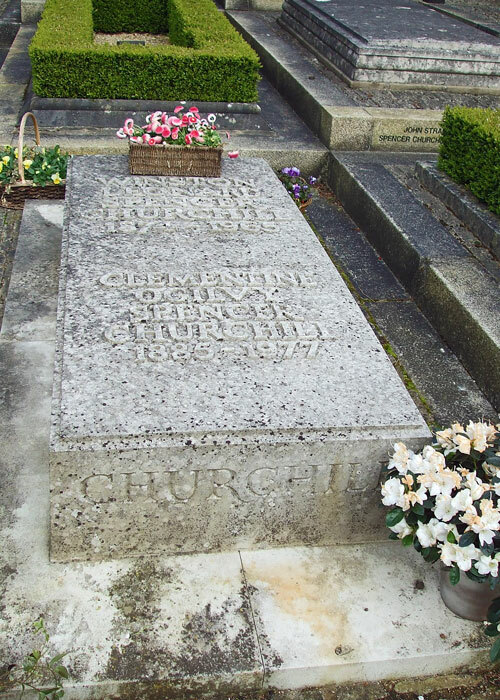 He is buried with his wife, Clementine Ogilvy Spencer Churchill. Close to him are the graves of his father, Lord Randolph Churchill, his mother, Jennie Jerome, his brother, Jack, and three of his children, Sarah, Diana and Randolph. It is something of a Churchill plot; nearby is the grave of the glittering American heiress, Consuelo Vanderbilt, who married the 9th Duke of Marlborough, Churchill’s cousin. Churchill was certainly no saint: for a start, he could be inconsiderate, selfish and a bully; but it strikes me that his genius lay in his rare strategic vision and the ability to mobilise people; he was a natural leader. Though undeniably a man of his time, he had the imagination and intelligence to see beyond the end of his nose, taking a longer view of history and future events than most people care to, or are capable of. He didn’t always get it right, of course, but few question that he was the right man in the right place in 1940. Churchill died aged 90 following a massive stroke, exactly 70 years after his father, on 24th January 1965. His wife, Clementine, followed him in 1977, aged 92. Amongst the 3,000 people that attended Churchill’s state funeral in St Paul’s Cathedral were 6 monarchs, including Queen Elizabeth II, and 15 heads of state. US President Johnson did not attend – allegedly because Churchill had missed President Roosevelt’s funeral; if so, proving that there is nothing new about playground politics. But ex-President Eisenhower was there, as was French President de Gaulle and ex-Prime Ministers Atlee and Eden. Churchill’s coffin was taken by barge up the Thames, where the organisers were surprised to see the cranes dip in salute, a tribute from the dockyard workers, and then to Waterloo Railway Station. 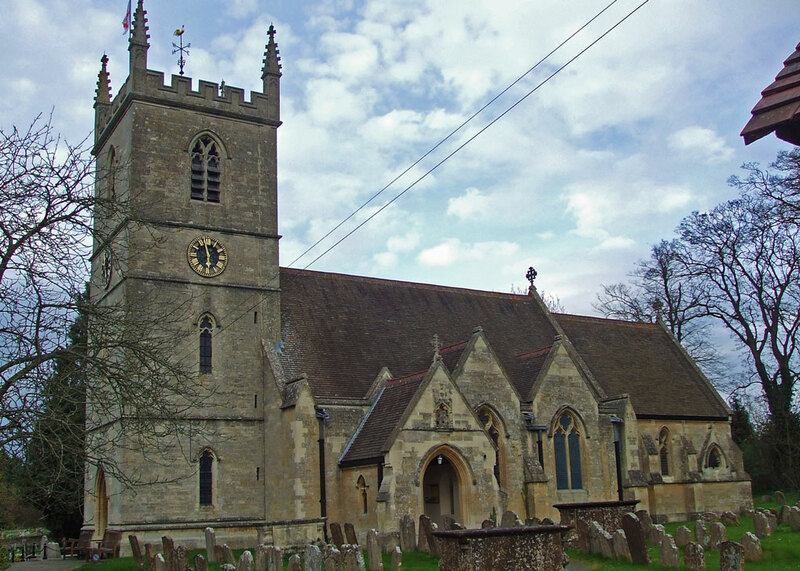 From Waterloo, the steam locomotive Winston Churchill journeyed to Long Hanborough in Oxfordshire, from which it is a short distance by road to St Martin’s Church, Bladon. There is a story that Churchill specifically wanted his coffin to pass through Waterloo Station, if de Gaulle outlived him; the obvious, more direct route from London to Hanborough is via Paddington Station. It was a final dig at his old ally. Winston Churchill was a master wordsmith and one of the most quoted men in history. When celebrating his 75th birthday, he is reputed to have said, “I am ready to meet my Maker. Whether my Maker is prepared for the ordeal of meeting me is another matter.” You can’t help wondering how they’re getting on. I am so fond of good quotes I can’t help but love him for his ability to turn a phrase so pithily. I just remembered that I have a cassette tape including one of his speeches that I might like to listen to again! He certainly had a way with words..! For some reason, your email is rejecting mine – nothing vital – I was just trying to reply to the kind message you sent via the contact page. Mike, I’m assuming you have Boris Johnson’s book of the man – I loved it, not knowing very much about him before. Such an amazing person. I’ve not read Boris’ book, though I’m sure it’s excellent. I’ve been watching John Lithgow’s portrayal of Churchill in the Netflix serial The Crown, and it’s just as I remember Churchill. I was born just after the war, and I remember hearing him on the radio (we didn’t have electricity for TV). And years later I remember watching the train carrying his body, and people gathering along the railway lines to honour him. I’ve seen plenty of versions of Churchill, but not that one – yet. Yes, someone else spotted my typo! Fantastic how you finished it with that quote too! I’m looking forward to seeing The Darkest Hour, Gary Oldman is a very good actor. I love that final quote here! I’ve a Churchill book on my pile to read and looking forward to seeing the Darkest Hour, which I hear is quite excellent. Thanks for your history and of course, the photos. Having grown up in Lyndon Johnson’s Texas and knowing a lot about the man, I am happy that the vile Johnson didn’t attend Churchill’s funeral. Democrat politicians like Johnson give American political writer Michael Walsh good reason to label their party as “a criminal organization masquerading as a political party”. This is a fine post, Mike, about one of the greatest men who ever lived. Few today realize that it was Churchill’s resolve that saved the West. Ha! That’s why I’ve never joined any. Prefer to be the outsider observing what’s going on and making up my own mind. Nice tribute Mike! We won’t spoil it by talking about Gallipoli! Been there many times, lovely spot. My oldest son has read many books on Winston. He is a favorite of my son’s. He knows many facts about him and has many of his quotes hanging on a bulletin board by his desk. Johnson on the other hand, no one in my family likes him or reads any books about him. And he has not quotes worth re quoting. I see a typo … And he has no quotes worth re quoting. Sorry about that Mike. What a wonderful post. I particularly liked the part about going through Waterloo station, such an interesting man and statesman. The Darkest Hour is high on our list of movies to watch. The previews looked amazing. I remember the funeral taking place, it was a very big national event. Having been born in the early fifties the war always seemed to be in a very distant age. It’s only as I got older that I realised that it ended less than 8 years before I arrived. It just didn’t seem relevant to me or my friends – one with German parents, one Polish and one English – soon to be joined by Jamaican immigrants and a family who had fled Hungary in ’56. Excellent post as usual. I have visited beautiful Blenheim but not Chartwell. Right man at the right time for the right job. Chartwell is wonderful – you get a real sense of the man and it has a fabulous views. Been to Tolkien’s grave, we should have gone to Churchill’s too. Even as a non-Brit I’d say that Churchill is one of the greatest leaders of last century, perhaps the best. We’ve been both to Blenheim and to Chartwell, so I was intrigued to also see this. Interesting post. I just finished watching The Crown. A tv series about The Royal family from the 1940’s until modern times, including history of Britain, and Winston Churchill’s part in it. Haven’t got round to the Crown yet, though some friends like it. I too, remember seeing the funeral on television – one of my first TV memories! I wonder if it occurred to Lyndon that Churchill was still neck deep in a war when FDR died and couldn’t just dash across the Atlantic for the occasion. That dig at De Gaulle is fitting, but De Gaulle deserved it. President Johnson was such a corrupt individual, who in the hell would want him to attend their funeral? But then he was a politician, so I’m being redundant. I’ve visited Blenheim, it’s a beautiful place. He was a great statesman when the country needed one. I agree that he was the right man for the moment in 1940…but at every other significant moment he was not. The economic ruin he brought about by returning Britain to the Gold Standard, for example, when Baldwin’s Chancellor of the Exchequer. I remember watching the funeral…and the cranes dipping. Excellent post. I have always been fascinated by Winston Churchill and love his quotes. I am keen to see that latest movie with Gary Oldmam playing the great statesman. I can recommend ‘Darkest Hour’ – it’s not 100% historically accurate, but it is a good movie and the acting, particularly Gary Oldman’s, is superb. Thanks! Gary Oldman is one of the better actors out there.